A new wearable designed by researchers from Rutgers University-New Brunswick assert that it can detect blood cell counts and particles in the air. The design of the tool is described in the research published in Microsystems and Nanoengineering. 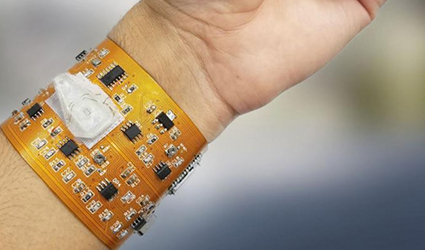 Researchers developed an upper limb wearable that comprises of a microfluidic impedance cytometer on a flexible substrate with a microfluidic biosensor. The researchers remarked that the system is capable of counting blood cells faster than the standard of care, via a pin-prick blood sample positioned on a standard microfluidic PDMS chip. The system can also transport information along a pathway to process electrical signals and digitize the data with a micro-controller and send it to a Bluetooth module, according to a statement. When the system receives the blood cell count, it transfers the data over to a doctor on a smartphone. Researchers said it also senses organic and inorganic particles in the air that could affect our health. "This would be really important for settings with lots of air pollutants and people want to measure the amount of tiny particles or dust they're exposed to day in and day out,” said Mehdi Javanmard, senior author of the study and assistant professor in the Department of Electrical and Computer Engineering in the School of Engineering.